The 2018 International Microwave Symposium (IMS2018) is upon us already, beginning on Sunday, June 10th, and running through Friday the 15th. This year's venue is the Pennsylvania Convention Center in Philadelphia*, Pennsylvania. Please be sure to stop by the booths of RF Cafe's advertisers and say, "Hello." It wouldn't hurt to mention that you appreciate their support in making RF Cafe available. Thank you, and enjoy the experience. 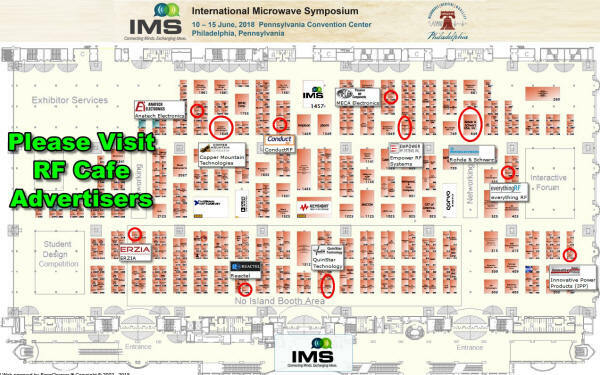 The image below was made using the interactive exhibit floor map on the IMS2018 website.